Westcon Equipment is a specialised supplier of biomass, organic recycling and arboriculture equipment for commercial and domestic use. They supply big brand names such as Jenz, Rayco and Lasco. However, due to the nature of the business, Westcon have a constant change of stock and brands. Therefore, when Westcon were looking for a new website, it was important that they were able to obtain full control of content management. Radikls have since designed their website, giving it a slick concise feel. The inclusion of a scrolling gallery on the homepage ensures that best-selling or featured products can be promoted easily. Moreover, Radikls offered Westcon their net-control asp package, through which they could implement the technical and aesthetic aspects of changes to their website, as well as updating the written content. 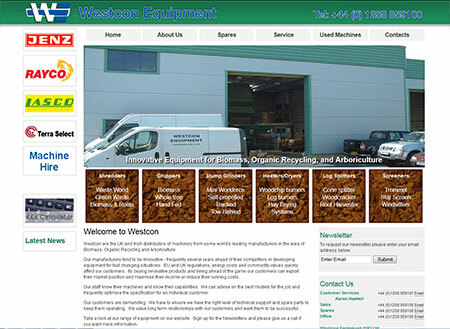 This flexible Content Management System (CMS), meant that Westcon could edit their content to coincide with new stock. The system made it easy for Westcon to take down or upload videos, spec sheets, new products and any pre-owned products that had become available for customers to purchase. Our CMS system has enabled Westcon to take complete control of their website content, allowing them to keep their consumer base informed about new products and up to date with news and information.